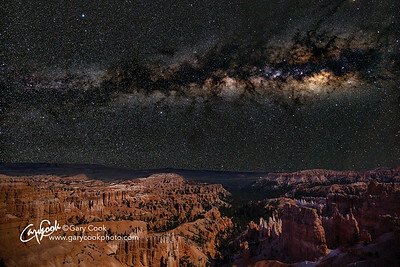 This is Bryce Canyon in southern Utah, with the Milky Way glowing over the horizon. The astonishing rock formations, the Hoodoos, which make Bryce Canyon so famous, provide an interesting foreground for the heart of our Galaxy. The millennia of time required to create and erode the Hoodoos makes a very appropriate metaphysical foil to the millennia needed for the light of our own Galaxy to reach us. 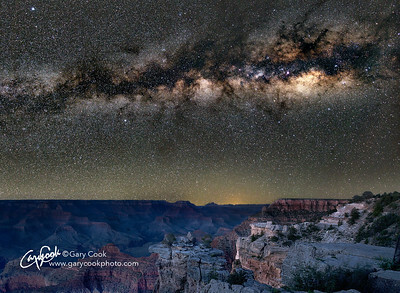 Milky Way over the Grand Canyon. While taking this shot, there was a very sudden and loud crunching and ripping sound in the dark. The long exposure gives the impression of it being fairly light, but was actually pitch black and I was standing right against the Canyon rim... The noise was very close and nearly made me jump into the void! A few seconds later, the same noise happened again.... At this point I lost all interest in preserving my night vision and turned on my flashlight. A large Elk was standing just a few feet from me. The noise was the Elk browsing on the small tufts of grass emerging from rock crevices. I never heard a sound from its approach. But it completely ignored me (and my flashlight) and eventually melted away into the darkness. 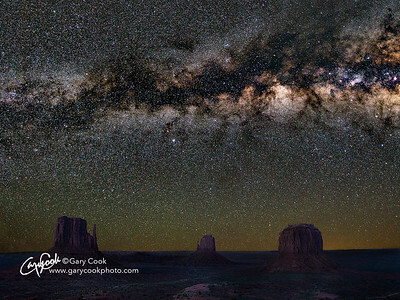 As night follows day, this is Monument Valley, but with the Milky Way behind the Mittens. There's a funny story associated with this image.... aficionados of the night sky, familiar with Monument Valley, may notice the Milky Way galactic center is about 1/3 of the way too far to the left than it should be. 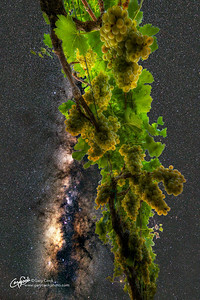 Most high definition astrophotography shots are taken using a precision tracking mount, and this image is no exception. This image required two hours of accumulated exposure time, and so the foreground is always completely blurred if the stars are to be trail free. The procedure, always, is to add the sky image back into a static foreground shot. So... you'd think an astrophotographer would know which direction the sky rotates! Using the first frame of the image stack as a reference, I mistakenly applied a Right Ascension (RA) correction estimate for looking northwards..... but the image here was taken looking south east..... Duh! So I placed the sky in the image using the opposite rotation and translation. So, like I said, you'd think I would know which way the sky rotates! But the final image is very pleasing so I have left things as they are with my error. Please enjoy my artistic license! I am indebted to my good friend, and much better astrophotographer than me, Dr. Robert Fugate, for spotting my foolishness! Celestial Schoolhouse. 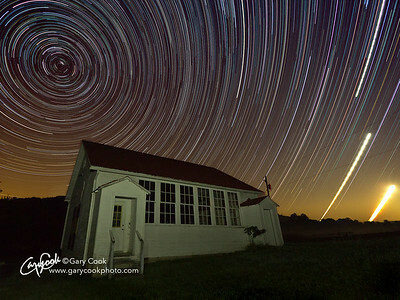 This is a 3 hour star trails exposure of the old School House at Lake Hope, near Zaleski, in southeastern Ohio. The two very bright trails on the right hand side are the rise of Venus and the crescent Moon. 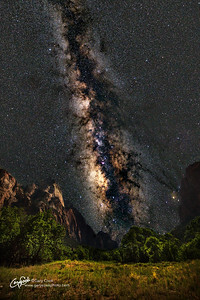 This is our Milky Way galaxy rising over Zion Valley in the Zion National Park in Utah. In the summer time the core of the Milky Way is visible above the horizon and long exposure photography reveals a multitude of stars, dust lanes and nebulae in extraordinary detail. Zion Valley is so dark and free of light pollution that the Milky Way actually casts a shadow on moonless nights. Sadly, growing global light pollution, made even worse by newer LED lights, means that few people will ever see this sight. Just a century ago this was visible from anywhere in the world. The Triangulum galaxy, also known as M33, was officially discovered by Charles Messier in August 1764, although it is likely that the Italian astronomer Giovanni Battista Hodierna also observed the same galaxy in 1654. It’s a beautiful example of a spiral galaxy, smaller than our own galaxy, with an estimated 40 billion stars. 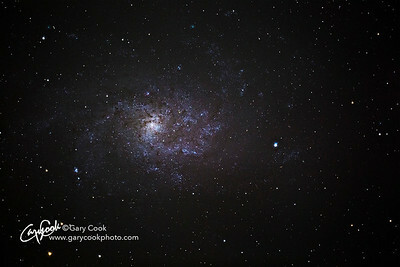 The Triangulum galaxy is just over 3 million light years from us and has a diameter of about 60,000 light years. The light that formed this image left the galaxy shortly after human beings began to walk on two legs and has only just arrived. It’s a shocking reminder of how BIG the universe really is, and how insignificant we are on the cosmic scale. Ancient light. This is the Andromeda Galaxy, taken at Zaleski Forest in South Eastern Ohio, using a stack of 20 separate 5 minute exposures. This was NOT taken with a telescope; just a regular 400 mm f/5.6 lens on a Canon 5D mk III. Although the Andromeda Galaxy is approximately 2.5 million light years from Earth, it is never the less the largest celestial object in our night sky. People are often amazed when told that it appears to be 5 or 6 times larger than the moon appears to be in the sky. But Andromeda is very faint, so there is not much to see with the naked eye, other than a slight smudge where the core of the Galaxy lies. But long exposure photography reveals this massive Galaxy in all its glory. The light captured in this image left the Galaxy 2,500,000 years ago and survived all that distance without hitting anything until it was captured in my camera. Precious and ancient light. The place where stars are born. This is the Orion Nebula, located just below Orion's Belt in the constellation of Orion, and is a vast nursery for newborn stars. Small to the naked eye, this is one occasion where I used a telescope to capture the image. 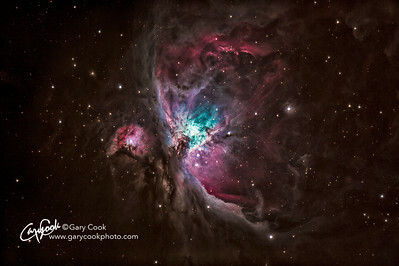 Small as it appears, the Orion Nebula is actually around 24 light years across and 1350 light years from earth. 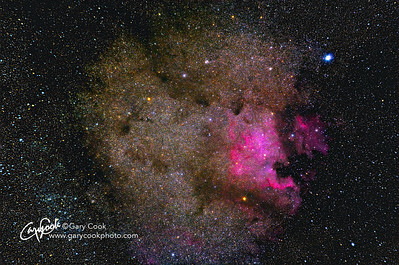 The North American Nebula. At this time of year it is almost directly overhead around 3:00 am in the morning in the USA. It is large enough to be seen clearly with binoculars. You can easily see the dark shape of the "Gulf of Mexico" in the Nebula. The bright blue-white star is Deneb and it is the brightest star in the constellation Cygnus. Although Deneb is around 1425 light years from earth, it is a fiercely powerful star with a luminosity more than 50,000 times that of our own sun. But it is burning so fast that it is unlikely to outlive our own sun and is expected to become a supernova sometime in the next few million years. Interestingly, since our Earth wobbles gradually over time (precesses) Polaris, our pole star, won't always be our pole star. Thousands of years ago Deneb appeared close to where Polaris appears to be relative to Earth. Deneb will once again be our pole star in around 10,000 years time. But for me, the most fascinating aspect of this image is the density of stars... take a look on full screen and zoom in a little. There are thousands and thousands of visible stars. The fascinating bit is that if you count all the Stars visible in the heavens, there are more galaxies than this number, each containing a similar number of stars.... Aren't we small and insignificant on this scale? 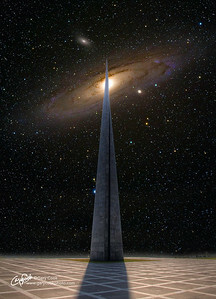 Life out there has to exist somewhere. The picture is a composite of two images. The foreground is of the very beautiful and moving Armenian Genocide Memorial in Yerevan, Armenia. The foreground was taken facing into the sun with the sun just obscured by the tip of the memorial. The background is the Andromeda Galaxy, captured from the Zaleski State Forest in Ohio using a celestial tracking mount. So many stars... 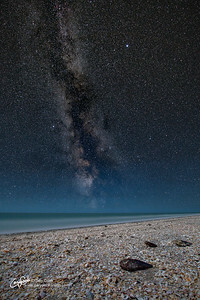 This is a midnight shot taken on Sanibel Island, just off the coast from Fort Myers in Florida. The summer time humidity was extremely high, hence the haze towards the horizon. But, oh my, the sky was filled with stars. This is the Andromeda Galaxy, taken from my home in Beavercreek, Ohio. This was NOT taken with a telescope; just a regular 420 mm camera lens (300 mm f/2.8 + 1.4x extender). Although the Andromeda Galaxy is approximately 2.5 million light years from Earth, it is the largest celestial object in our night sky, and is 5 to 6 times larger than the moon appears to be in the sky. But Andromeda is very faint, so there is not much to see with the naked eye, other than a slight smudge at the core of the Galaxy. Long exposure photography reveals this massive Galaxy in all its glory. The light captured in this image left the Galaxy 2,500,000 years ago and survived that distance without hitting anything until it was captured in my camera. Precious and ancient light. This is a composite shot in honor of the “super moons” that have hit the headlines in recent years. The foreground is regular astrophotgraphy shot of the Milky Way rising over a misty field in Zaleski State Forest in southeastern Ohio. 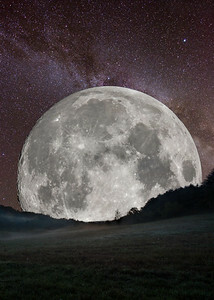 The moon appears much larger than real life, taken with a powerful telephoto lens and superimposed against the Milky Way sky. I love the contrast between the celestial Moon and the soft misty landscape.